I'm very excited to share a new cosmetic brand with you all that I've tried out recently, and really been loving! 100% Pure is an organic beauty company that is dedicated to providing skin care, cosmetics, and bath and body products that are cruelty-free and completely free of any harmful toxins. Every single thing they offer is 100% natural and 100% cruelty-free,100% free of artificial colors, artificial fragrances, synthetic chemical preservatives and all other toxins. I originally learned of 100% Pure through YouTube videos from Tashina Combs (Logical Harmony) and Rhian HY (Wifelife). 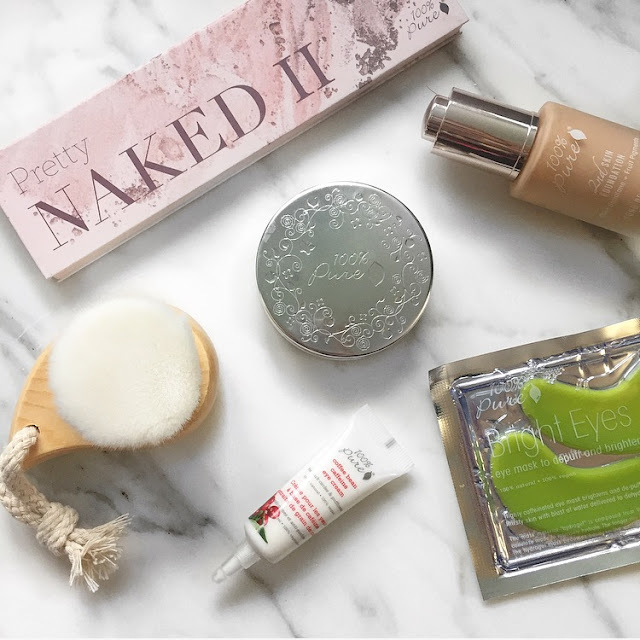 I was very interested, and both these YouTube beauty gurus loved so many 100% Pure items, I felt that I really need to try them out! This palette is just gorgeous. It is not often that I get a palette and love every shade and item in it, but that just happens to the case with this one! It comes with a highlighter, a blush, and three eye shadow shades - all colored by pigments from fruits, vegetables, flowers, and seeds. They are very smooth and buttery, blending so well and giving great pigment payoff. The highlighter is honestly one of the best I've come across recently. The blush is a great shade that will look good on a lot of skin tones, and their are three beautiful shadows. I will get lots of use out of the gold and brown shadows - and even though I don't see myself using the purple too much, it is still a really nice shade! The other makeup item I ended up loving is the Fruit Pigmented Powder Foundation in Golden Peach. BUT - I use it as a matte bronzer, not as a foundation (clearly, I would look like an oompa loompa putting this shade on my pale skin ha!). This is a great dupe for the Too Faced bronzers - which I no longer use as they sold out to Estee Lauder. 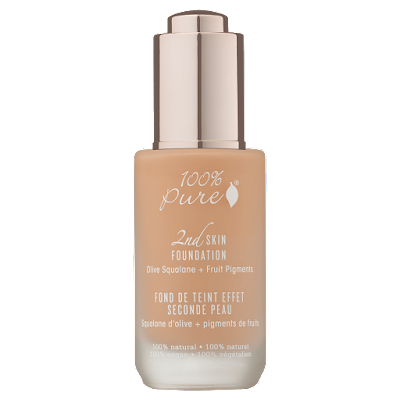 It is a great shade, and is very smooth and blendable with liquid foundation. There are also two darker and two lighter shades, so you can easily pick your perfect bronzer shade! The only item I didn't like in my order was the 2nd Skin liquid foundation. I wanted to love this, as I've seen it work on others and look beautiful - but it just hated my skin. They did not play well together AT ALL. I honestly took it off right away because I couldn't stand to have it on my face. I have dry skin, so it might just not work well for that skin type. It was a very thin and runny formula, and even though the color was okay, the actual product just didn't blend into my skin or provide any coverage. It also accentuated lines in my face and dry areas. All around, a big "NOPE" for me. Despite the disappointing foundation - I have been blown away by their skin care products that I ordered! The Facial Cleansing Brush is so soft and feel amazing to clean your face with in the evening. I am also OBSESSED with the Bright Eyes Masks. These are so amazing, I can't talk them up enough! They are extremely hydrating and have done wonders for my under eyes. I am definitely going to be repurchasing these and using them on a regular basis. What is cool too - you know they are working because they start out like gel pods, and as you wear them, they dry out because all their moisture is being sucked into your skin! Finally, I got a little sample size of their Coffee Bean Caffeine Eye Cream with my order. I have only been using this for a couple days, but it is very nice so far. I think it gives my under eyes a little boost in the morning - but will keep you updated the longer I use it. I've never heard of this brand before, but so many awesome products. I love that you got a variety of things to try out. 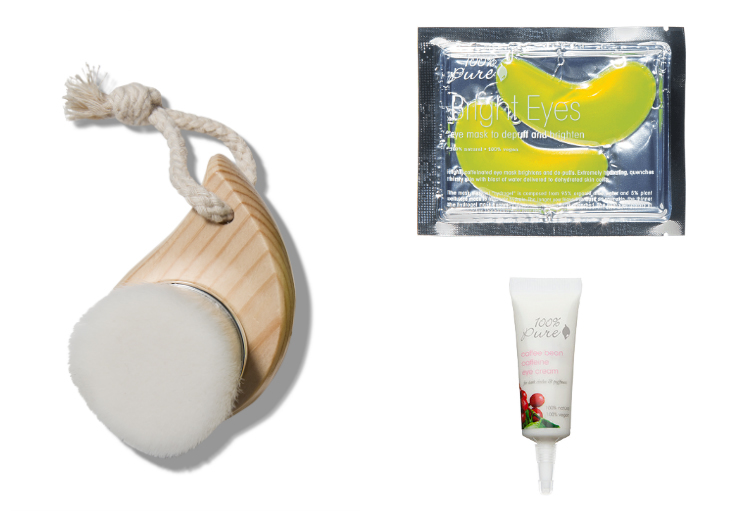 The eye masks sound so nice and I love the sound of the eye cream. You always find such awesome brands! I book marked those eye masks! Lord knows I need them! Haha! That eyeshadow palette is so pretty!